Buy through MusicWeb for £12.50 postage paid. The real surprise on this enjoyable disc is the very accomplished Flojtekoncert by the blind composer Niels Peter Jensen. Inexplicably neglected – the score only exists in the original handwritten score and orchestral parts – this elegant, beautifully sprung concerto is a real find. One can only wonder why ClassicO chose to give it a somewhat subdued ‘World Premiere Recording’ banner on the insert at the back of the CD jewel case. 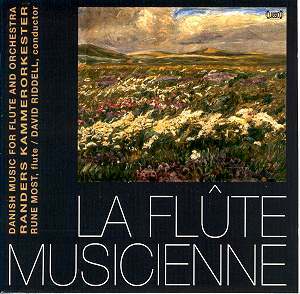 That cavil aside, the Danish flautist Rune Most possesses a lovely liquid tone that is most appealing, even when perhaps the musical invention flags a little. He is clearly attuned to the demands of this music, although given that the disc spans nearly two centuries, the musical styles here can best be described as conservative. This is particularly true of Svend Schultz’s La flûte musicienne, written barely thirty years ago. Schultz nailed his colours firmly to the mast way back in 1949, when he declared, ‘To enrich a human being with musical joy is for me a greater satisfaction than receiving a musical expert’s praise’. Another surprise; Schultz’s work is not perhaps as anodyne as its provenance might suggest. It is in fact an atmospheric piece that can hardly fail to please with its mix of good ‘tunes’ and shifting moods. After the jaunty opening Allegro comes the Adagio, particularly beguiling with its long, meditative flute solo and pizzicato strings. Most, who is also principal flautist with the Odense Symphony, negotiates the leaping scales and trills with ease, the flute tone clear and confident even near the top of its register. Yes, this may seem an anachronism in this age of spiky minimalism but when it’s played as deftly as this it hardly matters. Which reveals yet another surprise; the Randers Kammer-orkester – which doubles as the orchestra for The Danish National Opera and Åarhus Summer Opera – is the only permanent professional chamber orchestra in Denmark. This goes a long way towards explaining why this band and its Scottish-born conductor David Riddell have such a busy concert and recording schedule. But then this is a disc full of surprises. I’d guess that most listeners know Ole Schmidt as a conductor rather than a composer. In 1974 he was the first conductor to record all six of Carl Nielsen’s symphonies, a set that is still something of a benchmark today. Now for the pièce de résistance. The young Niels Peter Jensen (b. 1802) lost his sight early in life and was sent to The Royal Institute for the Blind to learn handicrafts, religion and arithmetic. Despite this outwardly dour regime the authorities also encouraged the young Jensen’s musical talents. Jensen learned to play the flute and contemporary accounts speak of his ability to assimilate music with ease. He also played the flute in public and became the first blind person in Denmark to be appointed to a public post, as organist of Sct. Petri Church, Copenhagen. The strong, muscular opening and thrilling coda of the Allegro speak of confidence and a surprising musical maturity. Jensen was probably around 28 when he wrote the concerto. The piece is brimming with delectable melodies for the flute and the orchestral writing is very accomplished indeed. Unlike the other works on this disc there is a genuine extended dialogue between soloist and orchestra here – most notably in the Larghetto. Comparisons with Mozart concertos would not be misplaced here; this really is a find. And given such a persuasive performance as this one might hope for more performances of this unjustly neglected work. All in all a most satisfying, if not particularly challenging, collection. The recording is full and warm, with the flute given just the right degree of prominence, forward yet never over bright or brittle. A pity then that the CD booklet, although generally informative, contains a number of typographical errors. Given that the English notes have probably been translated directly from Danish one could forgive the odd lapse of idiom. What is less forgivable is that Schultz’s name appears with at least two different spellings throughout. And the less said about the dreary cover artwork the better. Flute-lovers need not hesitate, and even if this repertoire isn’t your thing this disc is well worth investigating for the Jensen alone.